FOR his controversial 'kangkong' stunt in the weekly television program Sports 360, host Aaron Atayde has been suspended indefinitely by Sports5 from all PBA-related shows of the network, sources told Spin.ph. 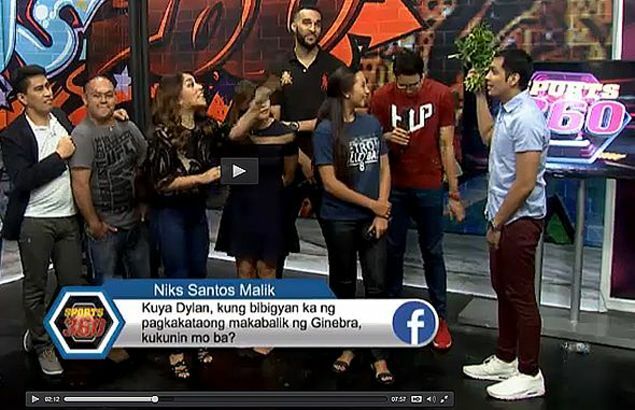 Atayde drew flak from Barangay Ginebra diehards after he waved kangkong in front of former Ginebra player Dylan Ababou in the May 17 episode of the program shown on Sundays before the PBA matches on TV5. The word kangkong (water spinach), which is a play on the idiom 'pupulutin sa kangkungan,' has been used by rival fans to taunt Ginebra diehards over the popular team’s eight-year title drought in the pro league. Ginebra fans made their anger known online after Atayde, also a radio DJ, waved kangkong infront of Ababou during one segment after the former Ginebra player was asked about a possible return to the Kings camp. The suspension was confirmed to Spin.ph by officials of San Miguel Corp. who brought to the PBA's attention the anger of the fans over the episode. Although Atayde appeared in the two succeeding episodes since the controversial May 17 episode, sources said the suspension was enforced after a meeting between PBA officials and TV5 head Noel Lorenzana. Contacted for comment, Lorenzana, through Sports5 head Chot Reyes, said in a text message to Spin.ph that officials of the network are "dealing with the matter privately." Adding to the tension, TV5 is the sister company of teams under the PLDT umbrella namely Meralco, Talk 'N Text and NLEX - arch-rivals of Ginebra and other teams under the SMC fold. Meanwhile, another Spin.ph source bared that the 'kangkong' joke was not entirely the idea of Atayde as he merely followed orders from the program's executive producer. There was no word on what action was taken against the show's producer.